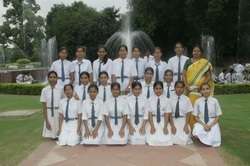 The Eco Club students of DAV Public school, Khera Khurd got the opportunity to visit Rashtrapati Bhawan for Nature trail on 23rd July ‘2011. The visit was organized by Department of Environment and Forest, Govt. of Delhi, to create awareness on nature conversation through direct interaction of the students with the nature.